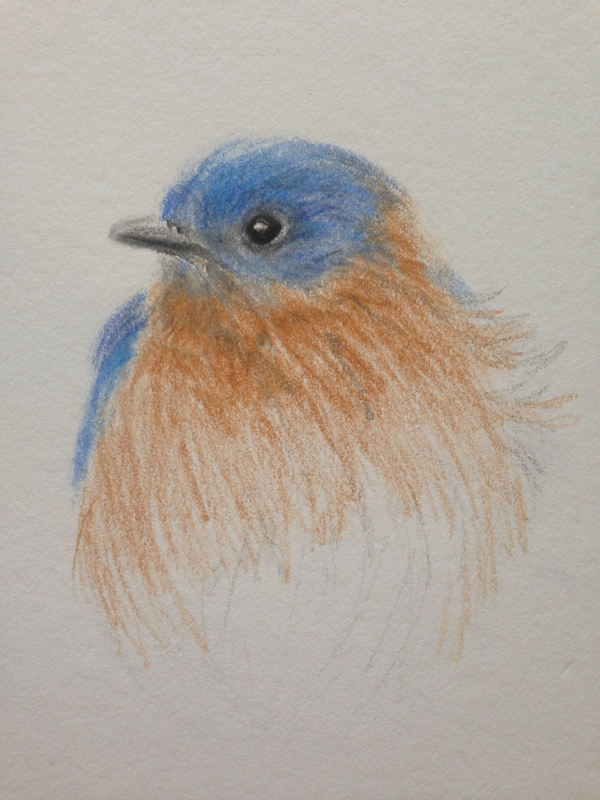 Colored pencils are great for birds. What a cutie! Thanks, Kerfe! Aren’t they?! I always wanna drop everything and get the sketchbook. Thank you so much, Denis! I enjoyed making this one. I think that you stopped at the perfect time. Sometimes that’s an art in itself, knowing when to stop! sigh…even the wind is visible in the ruffled little feathers!!! Aww thanks so much, Johanna! Thank you, Jodi, and love the blue hearts! Glad you’re chirping over there in Mars! Such a sweet blue bird! I love Kathy’s site too! Aww thanks so much, Cathe! I couldn’t resist them, they were all so gorgeous! Thanks, my sweet! Kathy’s photos are tremendous! Such a lovely Blue bird Laura, I just recently started following Kathy, her photography is awesome. Thanks for posting your wonderful art creations. Thank you, Sharon, for your visit and kind encouragement! Lol, he definitely didn’t seem pleased lol. I just love their little faces. So glad you enjoyed this, Kathy! Thank you so much, Charlie! I always appreciate your feedback! So beautiful! Make me think of spring. Stay warm! Love the look on his face! Great job. Thanks so much, Rebecca. They never fail to inspire me! You have some great photos to choose from. I like your return to color brightens the day! Thanks, Carmel! I could spend all day drawing Kathy’s birds, I think. 🙂 Glad you enjoyed those blues. Beautiful! I’ve noticed recently the best animal close ups seem to be done in pencil. Graphite pencil you mean, Catherine, or all kinds of pencils? Glad you liked this one! Oh good point. All. I remember color. Another fantastic bird drawing Laura! Such a cutie. Thanks, Susan! I’m so glad you enjoyed it! Aren’t they the sweetest? I’m so glad you like this, Jill. I can hardly resist Kathy’s photos. They are so close and I love the detail and personality in her subjects! 🙂 I hope to see your bluebird painting. Love the blue in those birds – I found it hard to try & copy here. I can almost touch the feathers on its head. This is brilliant. Thanks so much, Nexi! That’s so sweet of you. So delicate and so very beautiful. Love this piece and how the gentle pencil strokes suggest a gentle breeze. Thank you Laura, it is good to see you as well. I took a bit of a break and missed seeing everyone’s postings, hoping to get back in the rhythm and catch up to folks. Blue birds have a special place in my heart, and seeing yours was a true delight. Such a sweet bluebird. I just love her face! Thanks so much, Rachel! I could draw birds forever. They are like little beams of light, no matter what the weather. Absolutely. I have a cylinder of nuts fruit and mealworms in my feeder and i have birds i have never seen feeding before. Good for the soul! Great sketch Laura – I’ve really enjoyed your bird series. Thanks, Mary! Glad to hear that! There will definitely be more to come! He’s beautiful! Great drawing Laura. Thanks so much, Deborah! Having a great reference is huge. I’m really glad you enjoyed it! Thanks, Snehal! I really appreciate it! I love their beautiful colors and Kathy’s photos make it so much easier! Thanks, Olaotan! I appreciate you stopping by! Looking forward to more of your work! Thank you so much for stopping by and letting me know! Glad you like it! You captured the light in his eye so well, Laura! He is adorable! Totally awesome work 🙂 And I found a new blog about birds… thanks for that suggestion, because I like bird photographers too! You’re welcome, Dennis, and I’m so glad you enjoyed it! Kathy’s photos are wonderful, and if you ever need a bird identified, she’s your gal! Wonderful! I noticed it on one or two of your posts that you were wondering what kind of bird it is, and I can identify some birds, but not all, not with certainty. Kathy is good though, and there are other bird photographers here who could help out too, I’m sure. You get some really great photos! I like the closeup shots, it really helps me when I’m drawing. Anyway, thanks again for the follow and your help, and I hope to be featuring Shyna soonish! Lovely, lovely birdy makes me smile. Thanks! Bluebirds are my favorite. Hmm well one of my favorites hehe. Glad you enjoyed it Kath.